I'm popping in with another quick card for the Simon Says Stamp Wednesday Challenge and the Tic Tac Toe Challenge because my Simon Says Stamp November Card Kit arrived yesterday (a Sunday of all days) and I wanted to have a chance to use this purple background I made using Glossy Cardstock and Alcohol Inks. Simon's theme for this week is anything goes and I knew it would make for a quick card to use some of the kit contents like these Cardstock Stickers by Jen Hadfield for Pebbles Inc called Heart of Home which are available separately. I talked about how I created these backgrounds in this post and again in my previous post found here. I still want to do a bit more experimenting with Alcohol Inks so be sure to check back in a few days for a bit more information. I am planning to try out regular reinkers and see if they work! 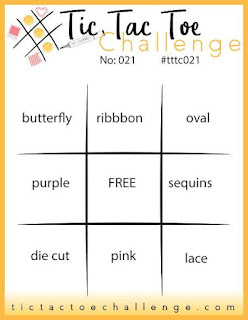 As you can see, I used the left column for my card which is butterfly, purple, and die cut. To begin my card, I die cut the Amethyst & Gold Mixative marbled panel using Hemstitch Rectangles from Spellbinders. I love these dies and even have a ladies handkerchief that belonged to my great grandmother with this type of hem on it. I selected the sticker elements I wanted to use for my card and placed foam adhesive on the back of the 2 elements I wanted to pop up on foam tape. Without removing the release paper yet, I dusted over the exposed areas of the stickers with some baby powder to deactivate them. Then I could pull the release paper off and place them where I wanted on the focal panel. For the tiny butterfly, I just stuck that directly to my focal panel. Cards don't get much easier than this and I was glad of the chance to play with my November Card Kit. I used Royal Velvet Cardstock from Papertrey Ink for my card base and my focal panel. Be sure to stop over to the Simon Says Stamp Wednesday Challenge and check out all the gorgeous entries in the "Anything Goes" category for this week. There are more than 550 entries at this time to inspire you. Beautiful marbled panel!! Wowzers! What a beautiful card! 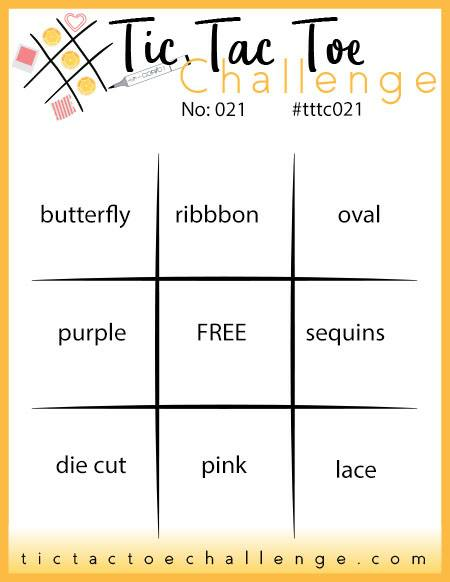 Thank you for sharing with us at Tic Tac Toe challenges!